During the Jewish High Holy Days, we read from the biblical book of Leviticus where God enjoins the ancient Hebrews to leave the gleanings of their fields for the poor. I began to think about the conservative members of the current Supreme Court. Though it’s 5000 years later, stick with me. Conservative nominees, including Judge Kavanaugh, have been telling us that decisions begin and end with the words of the law, a claim we call textualism. How can a textualist obey the ancient biblical injunction about gleanings? Gleanings are what’s left in the fields after the harvest. Are textualists absolving us from caring for the poor, and, if not, how do they suggest we accomplish it? Most of us don’t have gleanings – we’re not farmers. Are only farmers responsible to the poor, allowing the rest of us to take comfort from their work. That would be a “strict” textual solution but it’s not very satisfying since the Bible repeatedly stresses our obligation to the poor. Then how should we do it? Led by Scalia, textualists often point to specific examples of how it was done when the authoritative texts were laid down. Of course, that means ancient solutions become less and less relevant. Scarcer and scarcer gleanings are left for more and more of the poor and they are harder and harder for the destitute to reach. So, the textualist philosophy gradually cancels the maxim itself. The textualists’ approach means the poor can go hungry as gleanings decline in the modern world. An obvious solution is to identify the objectives of the biblical passage about gleanings and figure out how it might most appropriately be done. Scalia fought that idea. He railed against the possibility that the principles or values that underlie legal injunctions might be interpreted by judges. Liberals might try to figure out how to care for the poor instead of declaring the injunction unworkable. In other cases, liberals might try to assure accurate trial results, not merely obedience to traditional formalities. The defendant lost but had a chance so it’s over. The late Justice Blackmun once cringed when a father beat his son so badly that the boy’s brain was destroyed and he became almost literally a vegetable. “Poor Joshua” he wrote and was lambasted for letting his sympathy affect his judgment. You may remember that Justice Sotomayor was subjected to the same attack. Sympathy, in the textualists’ view, negates legality. Since when, however, should one be ashamed of sympathy for the unfortunate? Since when is justice defined by not caring about the impact of the rules we create on the people who have to live with them? Textualism camouflages abuses written into the legal system by justices without principles, as if “the law,” and not the judges, were doing all the damage. It’s time to disqualify judges for lack of empathy. Does the law have no gleanings to offer? No principles of caring and just behavior with which to help fill in the gaps and the changes in legal meanings that take place over time? I have never believed that the written law is responsible for the harm done by judges who mangle it with closed hearts and eyes blind to reality. Brett Kavanaugh, Trump’s latest nominee, continues the charade of denying that their cramped sense of justice is crucial to the decisions they make. Regardless of what the FBI finds about what happened to Dr. Ford, Kavanaugh has not justified our confidence by evasively blaming everything on his reading of past decisions. — This commentary was broadcast on WAMC Northeast Report, September 25, 2018. People often ask me whether something is constitutional. I often respond by asking what they mean. Our Constitution is only as good as the people handling it. Beyond that it’s a piece of paper, that bends, folds and tears. The Founding Fathers often referred to constitutional language as parchment barriers. All law is about prediction. What will the Court, or a judgment do and will the president or the governors enforce what they decree? The 13th, 14th and 15th Amendments became meaningless for decades after President Hayes removed the troops from the former Confederate states. Brown really meant something when Eisenhower sent the troops to Little Rock. Sure, I think the Constitution should mean more; it should protects us. But I have only the power of argument. When I argue in the courts, I don’t just tell them what I think is right – I argue in ways I think will influence the court I am addressing. I learned that lesson years ago after writing a brief on behalf of several political scientists to explain an aspect of the 1st Amendment. We were only appearing as friends of the court, but our views carried the day on the Court of Appeals. One of the judges wrote that his reasons were well stated in our brief. Of course I thought that judge was a genius. But though we won on the Supreme Court, the grounds of victory had nothing to do with our brief. Plaintiff’s attorney crafted his argument to fit the specific concerns of the justices who would support our position. We eked out a 5-4 victory but when those justices left the Court, it was quietly overruled. It all depends. Republicans pronounce that sympathy is no part of law, but then where is justice? They claim bound to follow only ancient dictionaries to tell us how two-century old language should be read now, assuming the ancients wouldn’t lift a finger about our problems. Or they claim to rely on precedent. But precedent isn’t self-justifying. We distinguish the authority of Brown v. Board of Education from the horror of Dred Scott or Plessy v. Ferguson because Brown accurately stated enduring values and the others did not. That’s a judgment about decency and has nothing to do with balls and strikes. This is not a baseball game; language interpreted without decency and humanity slanders the people who wrote and adopted it. Nominees hiding behind precedent hide their heartlessness behind smokescreens and deny the obvious, that their values, or lack of them, will determine how they see and shape the law. Gorsuch could not tell you that because his sense of good and evil are far from what most Americans would accept. So he and his supporters rely on empty jargon about precedent. But judges exercise judgment about precedent just as they do about language. That’s why we need judges with good judgment, not judges claiming to be logicians with computers who derive answers automatically, unthinkingly and without reference to consequences. That refusal to care is the bastardization of law. When Justice Blackmun protested a decision that left no one responsible for the helplessness of a small boy, he wrote “Poor Joshua” with understated eloquence. Poor Joshua indeed. Law, like the Tin Man in the Wizard of Oz, needs a heart. — This commentary was broadcast on WAMC Northeast Report, April 4, 2017. This is the third in a series on Money in Politics. Last time we discussed the difficulty of getting the Court to overrule Citizens United. Because of that, several constitutional amendments have been proposed as joint resolutions and introduced in Congress in order to undo Citizens United and overrule the idea that a corporation is a legal person. After studying them, however, it became clear they have been so sloppily drafted that no one could tell you what they would do. None that I’ve seen addresses the associations we join. Political, civil liberties, civil rights, and environmental organizations, and professional associations, all take stands on candidates or political issues. The ACLU went to court years ago to protect its ability to take out an ad over the impeachment of President Nixon. All except the smallest are incorporated and are protected by the right of association. The First Amendment protects speech, press, assembly and petition. In combination, that’s what our associations do to influence public attitudes about major issues. They incorporate to outlast their founders, use the courts, open bank accounts, organize membership and leadership, seek tax-exempt status and protect members from liability for any mistakes the organizations make. Those associations matter. The lasting impact that people like Rosa Parks and Martin Luther King had on the Civil Rights Movement depended on the organizations that did the advance work, and drove home the meaning of what they and other great leaders of the Movement did. That’s true of most successful political movements. Yet the proposed Amendments stop after denying that corporations have constitutional rights and authorizing legislatures to regulate them. A literalist could read the Amendments as superseding and repealing all previous protections for the organizations we rely on to reform politics, the environment, civil rights and just about everything we care about. Nothing in the proposals protects them. Sometimes courts hang on to interpretations of older text and neuter newer language, as the Supreme Court has with language in the amendments passed in the aftermath of the Civil War. In the absence of any language about associations, it is impossible to say what the courts would do to the proposals regarding associations. One proposal denies that it limits the people’s rights, but it is attached to text which limits what the Court defines as part of the people’s First Amendment rights. The meaning of that exception is mysterious, just authorizing courts to figure it out. Only two amendments mention a free press. They merely say they “shall [not] be construed to alter the freedom of the press.” That’s nice but the exceptions swallow the proposals because much of political campaigns is in or can be done by the press. Whoever controls the distinction controls the result, whether authorities can squelch the press or the press becomes the next form of improper power. Corporations often set up subsidiaries for otherwise regulated functions, such as associations or media companies, like what Murdock did with Fox. Some media companies are owned by conglomerates. Many associations set up separate organizations for tax purposes. The NAACP set up Thurgood Marshall’s organization around 1940 to separate its legal work from other organizational work. Lawyers fashion ways to live with rules. So what would a press exception do? Nor should media companies and political associations have a monopoly on political speech. The law should be neutral and should not protect the speech of some while shackling the speech of others. 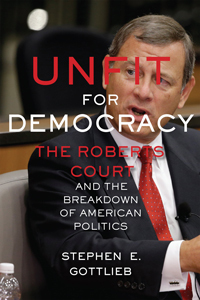 Whatever you think of the Roberts Court, and I’m no fan, these are serious issues and no proposal addresses them. Instead they provide feel good language covering sloppy and dangerous clauses. — This commentary was broadcast on WAMC Northeast Report, July 19, 2016. Amer. Civil Liberties Union, Inc. v. Jennings, 366 F. Supp. 1041 (D.D.C. 1973). You are currently browsing the archives for the Interpretation category.